The perfect blend of timeless elegance and modern pizzazz, this stylish chaise lounge boasts gently flared arms highlighted with pleating and matching flared wood feet. 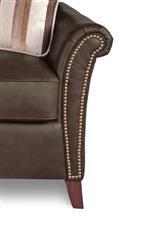 Optional choice of nailhead trim is also available, nailhead studs are available in brass or platinum finish and will adorn this design on the front arm panels and back collar. The Phoebe Transitional Flared Arm Chaise Lounge by La-Z-Boy at Thornton Furniture in the Bowling Green, Alvaton, Glasgow, Scottsville, Franklin area. Product availability may vary. Contact us for the most current availability on this product. Padding & Ergonomics Premier ComfortCore® is zoned cushion technology for optimal firmness and lasting comfort available on select stationary sofas, chairs, ottomans and sectionals. Upgrade to the ComfortCore® GEL cushion (available for additional charge) to add gel-infused memory foam for the ultimate in sink-in comfort. The reason La-Z-Boy is such a time-honored and trusted name in furniture is that they are constantly trying to make better products that meet the ever-changing needs of today's home. One of the latest innovations, ComfortCore® cushions, are specially designed with cushion "zones" for lasting support and softness where you most need it. Not only does the Phoebe group include this exclusive cushion technology, but it boasts a pleasingly stylish design that will last the test of time. 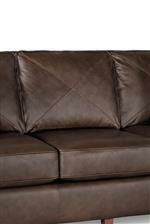 Choose the Phoebe group for living room seating that you can love and appreciate for years to come. The Phoebe collection is a great option if you are looking for Transitional furniture in the Bowling Green, Alvaton, Glasgow, Scottsville, Franklin area. Browse other items in the Phoebe collection from Thornton Furniture in the Bowling Green, Alvaton, Glasgow, Scottsville, Franklin area.